ARCOMPANY | Social Selling … Are B2C Blogs Worth The Effort? Social Selling … Are B2C Blogs Worth The Effort? Home / Future Of Business / Social Selling … Are B2C Blogs Worth The Effort? Although it didn’t reach critical acclaim, Charlie Sheen’s Hot Shots, Part Deux, Just Deux It! is the sequel that inspired my title for this Blog. And like all good sequels, the story line must be related, the characters must be consistent, and hopefully the plot and execution are better than the original. The original to this sequel Blog is my ArCompany post entitled: Social Selling … Are B2B Blogs Worth The Effort? 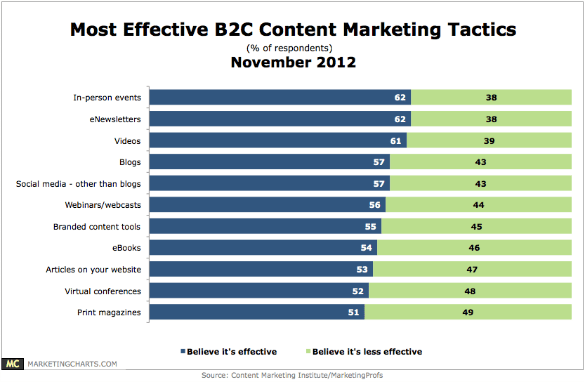 Back in November of 2012, the Content Marketing Institute and Marketing Profs did a joint study to determine the most effective content marketing tactics for B2C companies. The following chart from Marketing Charts provides a good summary. You will note from the above chart, that in the B2C realm, Blogs were considered the fourth most effective content marketing tactic at 57% of the respondents in 2012. In my “Part Un” to this “Part Deux” sequel I point out that Blogs in the B2B world were generally considered the ninth most effective tactic at 29% (read my original Blog to see the how the real story turned out for B2B Blogs). So is this the final word on this B2C Blogging topic? Like I said in the earlier B2B Blog, the devil is always in the details and a “drill down” into the data is always recommended. Besides, a year has passed since the above study was done and things move quickly in our digital / social media world. First let’s take a comparative look between B2B and B2C companies regarding their content marketing approaches. 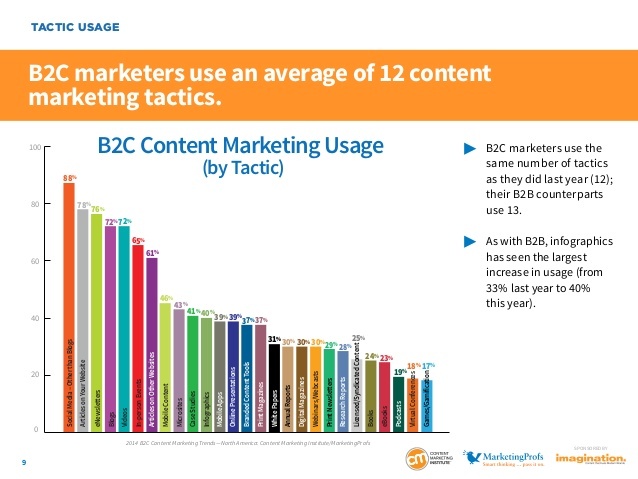 Surprisingly, the following chart from MarketingCharts, taken from a more recent 2013 study done by Marketing Profs (Ann Handley – @MarketingProfs) and the Content Marketing Institute (CMI) (@JoePulizzi) shows that there is more in common between B2B and B2C than one might expect. Both are big users of content marketing, and this use has increased over last year (2012). In both B2B and B2C cases, their most favoured content marketing tactics were social media and articles on their own websites. In terms of their most effective tactics, in-person events are favoured by both, but in terms of digital content marketing, E-newsletters are favored by B2C, while case studies are favored by B2B. This makes sense, because business customers typically use a much more rigorous purchasing process requiring more detail, while consumers are typically more interested in short “soundbytes” or summary information. And of course, the social media platform will be different between B2B (favoured LinkedIn) and B2C (favoured Facebook). Although, the study also showed that 71% of B2C Marketers are now turning to LinkedIn as a content distribution channel, up significantly from 51% in 2012. This illustrates that B2C companies are recognizing that many of their customers have both a social persona as a consumer and as a business person. Keep this thought in mind when you review my suggested “best of breed” B2C Blogs near the end of this article (hint: Citrix). Further “drill down” into the study shows that once you get beyond the In-person events, B2C and B2B begin to diverge. 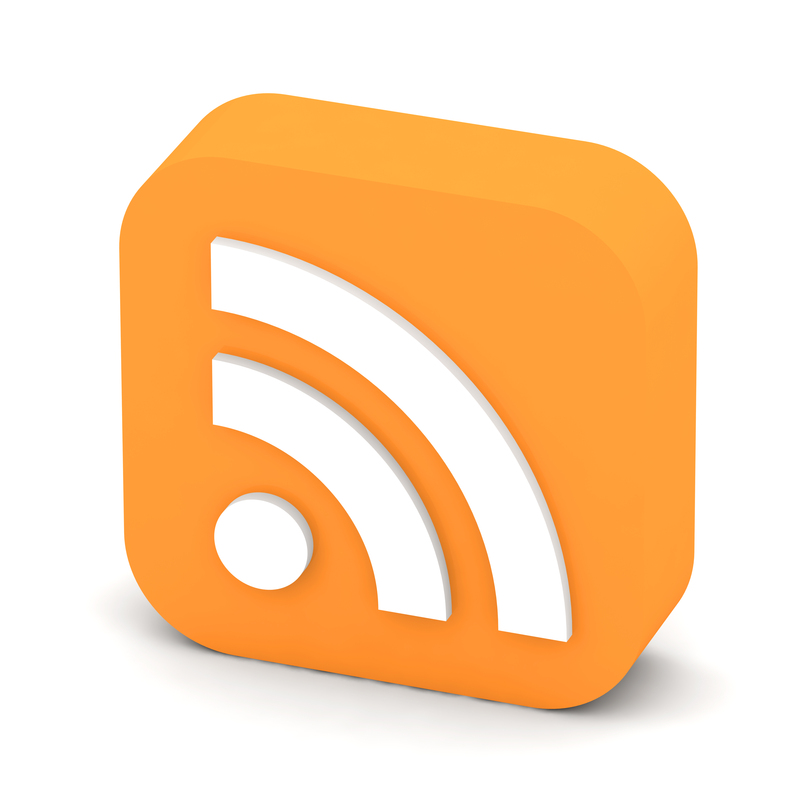 For B2C, the use of Blogs at 72% in 2013, actually increased from 57% in 2012. Even more surprising, B2C Blogs moved up to be even with Videos to become the second most important digital content marketing tactic behind E-Newsletters (this assumes that In-Person Events are not considered digital content). If you haven’t guessed yet, I am a huge advocate of drilling down into the data to find the real nuggets. It is important to examine the “most effective in class” performers compared to the average or “least effective in class” performers. Doing a further “drill down” on this study provided perhaps the most important observation: The “most effective in class” content marketing performers in both the B2B and the B2C groups rated Blogs much higher than their “less effective in class” peers, and in some cases the “most effective in class” rated Blogs higher than In-Person Events! So, the moral of the story is: whether you are B2C or B2B, emphasize your Blogs and get them out there because the overachieving “most effective in class” content marketers say so. Some of the other findings from these studies will help you to understand the context of what these marketers were trying to achieve and how they measured success. But I would like to draw your attention to the last bullet point below, as it speaks to an area where marketers should spend some additional time. It’s all good to focus on a tactic like Blogs, but unless it is part of a documented content strategy complete with measurables, your tactics might not work for you, or worse you will spend money on them and may never know their value. (As an aside, there is an old adage that says “if it is not written down, it doesn’t exist”, hence the need for documentation). Brand awareness is the top content marketing goal for both B2C (79%) and B2B (82%) marketers. Customer acquisition (71%) and retention/loyalty (65%) are the next-most common goals for B2C respondents, while lead generation is next among B2B respondents. Web traffic is the top content marketing metric for both B2C (66%) and B2B (63%) marketers. Social media sharing is relatively more important to B2C respondents, who are far less interested in measuring sales quality and quantity. 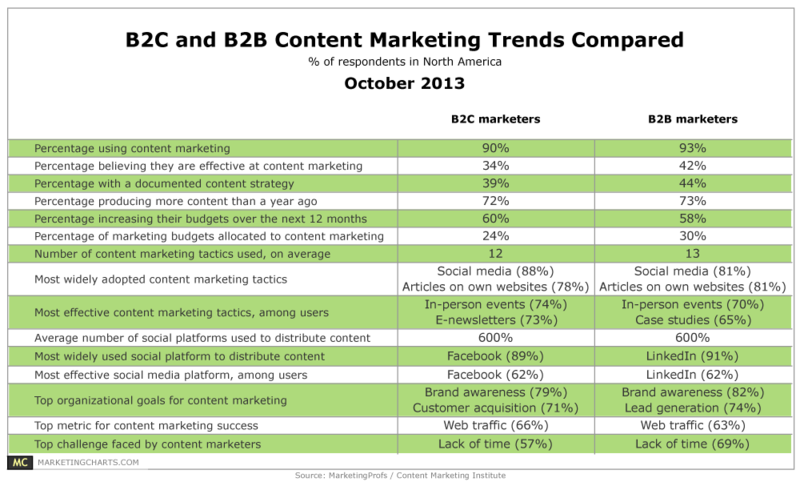 Lack of time is the top challenge faced by both B2C (57%) and B2B (69%) content marketers. B2C respondents are relatively more concerned with producing the kind of content that engages, while B2B marketers are more concerned with producing enough content. 39% of B2C marketers have a documented content strategy, compared to 44% of B2B marketers. And although ArCompany is not a B2C Blog, it should provide good reading for B2C companies – see ArCompany Blog (@ArCIntel) which is the home for this blog article (a little gratuitous promotion). I hope you enjoyed this blog and it has stimulated some questions and conversation, or maybe even caused some action! Social Selling … Are B2B Blogs Worth The Effort?